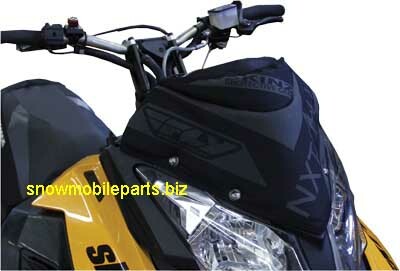 Snowmobile Windshield Padded semi-rigid materials make access easy. Retains shape when not full. Heavy Duty zippers. Reflective piping. Attaches to OEM hole locations & uses existing fasteners. Durable, structural fabric construction won't break or bend. Low profile, centered storage solution. Requires removal of windshield. 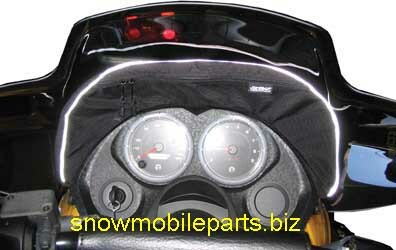 Windshield pack is vented allowing items to be warmed and dried. Hole required in the headlight pod. Fits with or without headlight installed. Keeps goggles/gloves in pack warm & dry. Requires removal of windshield. Made of super tough Cordura. Dual zippers. Easy Installation.